The boating industry, although changed by the new economy, continues to initiate improved and innovative products and boat parts for 2011. Lasdrop has added duel injection ports for their entire product line of shaft seals over 1-1/8″. Dual injection ports can also be fitted to smaller shafts.﻿ ﻿﻿﻿﻿The primary reason for this change? To accommodate dual engines for a situation when one engine is shutdown, but the other is still being used to ‘get home’. Water will still be able to cycle through the seal of the still turning shaft to keep it cool from either engine to either shaft seal. For those boats with just one shaft, don’t worry, the Lasdrop kit also comes complete with a block off plug. This easy to ignore boat part now lasts longer and is made more reliable. Additionally, all installation hardware is now included. These pot pullers are designed for serious recreational and commercial use with four improved electric models. The Light Commercial pot hauler is built to pull in 300 pound pots all day and features new cooling fins on the 2.1 HP motor to insure long life. All of the Safe-T-Puller pot haulers now include a factory installed roller-fairlead and quick-detach kit. The Safe-T-Hauler includes roller-fairlead, swivel block and 3-piece davit w/SS quick-release pins. Quality Products Northwest continues to build pot pullers as it has for more than a decade and a half; making improvements to offer long service life for the fishing industry. Although not entirely new on the scene with marine products and boat parts, Glendinning introduced the Pro-X Control Cables just a couple of years back. The Pro-X control cables are designed for high performance operation with a minimum loss of motion and almost no resistant forces. What this means for the recreational and commercial user is simply a long-lasting low friction, high performance control cable to replace original Morse or Teleflex fitted cables. Control cables are available in the popular 33C configuration as well as Mercury, OMC, Gen I, Gen II, BRP, Johnson, Evinrude Style, 43 C/BC, 64 C/BC and more. Before we get into the 2010 winners, Go2marine would like to thank all who entered! We had stacks of entries which you can view the popular ones on our Go2marine Facebook Page, in the Photos tab, along with past years winners. It was hard to choose and the pictures were selected by the staff here who, when combined, represents diverse boating backgrounds. The new addition for the 2011 Contest year will be “The Hotdog Category” which will be open to photos of pets and boating. This is the photo that tipped the scale for the new category. Yes, that is a real photo, taken after a day of tough boating with the family. 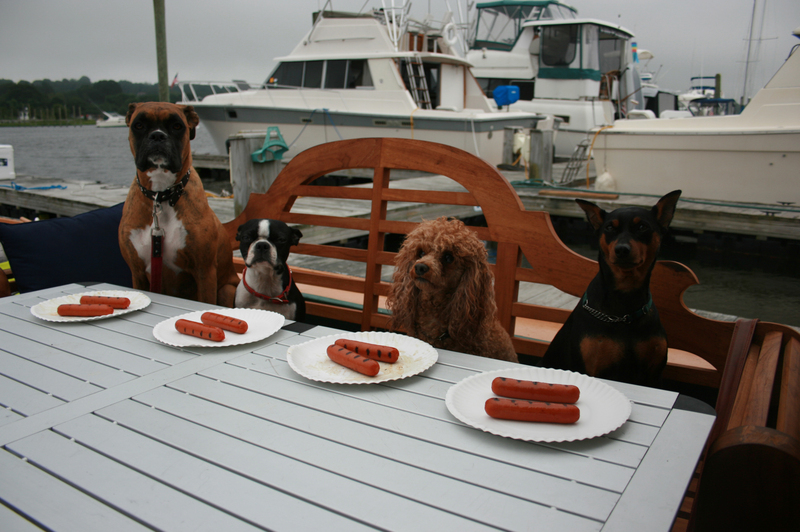 Send us in your pet boating pictures to boatersline@go2marine.com with the subject “2011 Hotdog Photo”. The first place entries won a $100 gift certificate in each of the three categories. Additionally, we ended up choosing 4 Runner ups who won a $50 gift certificate each. Go2marine does appreciate all who entered and has chosen to send any of the other entries a $10 coupon. 1. Best Action Photo – $100 Winner. Hannah Redmond leaps from her 1968 Trojan Bimini, Chesapeake Bay, MD; taken by Michael Redmond. My restored ’68 Trojan Bimini “MoNaH” is the perfect boat in the upper Chesapeake for both family outings and fishing alone. My daughters have spent the past decade enjoying the beauty and bounty of the bay and we couldnt imagine a more perfect boat to do it on! 2. Best Classic / Yacht Photo – $100 Winner. This was taken at low tide in Skerries, Ireland. 3. Best Family / Cruising Photo – $100 Winner. We were dog sitting the Boxer (Shelby) for the weekend. The other 3, Barbie, Sponge Bob and Baker are ours and we named our boat, “The Three B’s” after them. They come everywhere with us and LOVE to go on the boat even more than car rides! They all have their sea legs and lifejackets, know their way around the boat and like to swim at Potters Cove. Summer Racing series in Narragansett Bay from Wickford this summer. The Jamestown Bridge and Plum Point lighthouse is in the background. This boat had just lost their spinnaker. 6. Runner Up Classic / Yacht Photo – $50 Winner. The Sea Dog is a Pacific Northwest classic yacht cruising the San Juan Islands. This photo was taken off the deck of our Classic converted 88’ converted Tug Boat called the Tyee. This photo of the Sea Dog is in Deer Harbor (Orcas Island) 2010. 7. Runner Up Family / Cruising Photo – $50 Winner. Myself and the Admiral tucked into a sheltered spot on a damp day, on the Bras D’Or Lakes, Cape Breton, Nova Scotia. Thank you to all who entered and we will see you again next year! You may send photos to: boatersline@go2marine.com with the subject “2011 Boating Photos”.